CNC milling machine provided with machining software program in ready form by the manufacturer. These are called machining cycles. 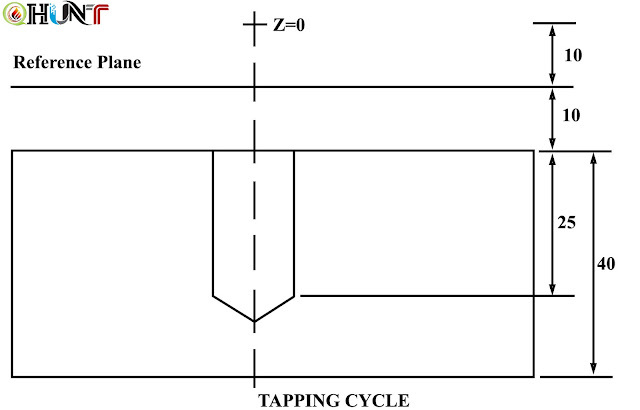 These cycles are already programmed in the form of parameters of a particular operation. Whenever the stored programmed similarity arises, simply the cycles called on the computer and necessary parameter centred then the program is ready. These cycles save valuable programming time and computer memory space and make it very convenient to the operator. 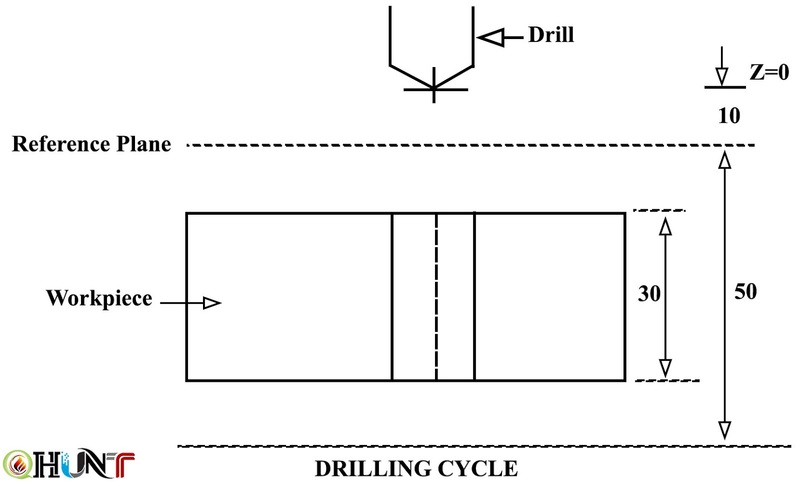 Drilling Cycle. Fixed cycle for drilling a hole is applicable; where the complete drilling is completed by giving information in a single block. (c) N03 - Drilling tool moves to reference plane in rapid traverse. The reference plane is selected above the work piece surface to avoid the drill striking the work piece while moving in rapid traverse. (d) N04 - Call drilling Cycle. The spindle starts rotating at 800 rpm in clockwise direction and the hole is drilled at the required position at the given feed rate of 150 mm I minute. The drilling tool is positioned at reference plane after the drilling operation is completed. 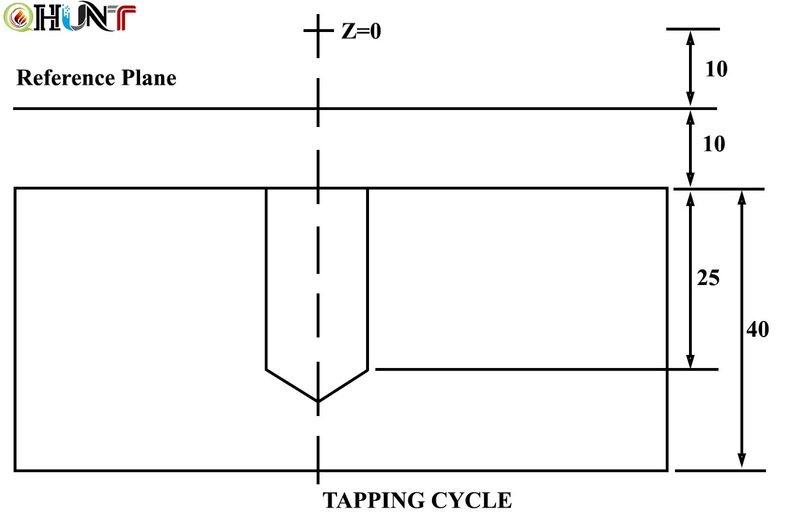 Threading (Tapping) Cycle. 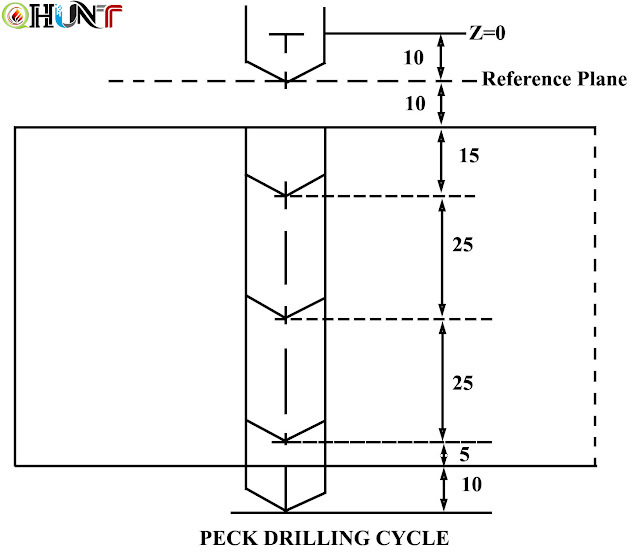 The tapping operation, involves positioning of tap at required X and Y position, moving it rapidly to reference plane and feeding into the predrilled hole in the work piece at given feed rate. The spindle rotation is then reversed and the tap is brought back to reference plane at the programmed feed rate. The spindle rotation is again reversed to prepare for next tapping operation.